M Said Maani Takrouri, A al Maghayreh, M Obeidat. Rhizomelic Chondrodysplasia Punctata Presenting For Surgery And Anesthesia. The Internet Journal of Anesthesiology. 2008 Volume 19 Number 1. Rhizomelic chondrodysplasia punctata (RCDP) is one subdivision of group of anomalies called Chondrodysplasia calcificans punctata (CCP), which is a rare genetic disorder of peroxisomal metabolism that is characterized clinically by shortening of the proximal limbs, cataracts, a characteristic facial appearance, failure to thrive, and mental retardation. This report describes two children who came for surgical palliative procedures and were exposed to four anesthesia. The anesthesia technique were kept simple difficult intubation was observed on one occasion citing this experience may aid prognosis and guide management in similar cases. Rhizomelic Chondrodysplasia Punctata (RCDP) is one subdivision of group of anomalies called Chondrodysplasia calcificans punctata (CCP), which is a rare congenital syndrome caused by a peroxisomal dysfunction . First described in 1914. Chondrodysplasia punctata is also known as chondrodystrophia calcificans congenita or congenital stippled epiphyses. The disease variably defined as mesomelic or rhizomelic dwarfism depending on the gene transmission. The abnormal growth leads in surviving children to facial dysmorphism, kyphoscoliosis, limb shortness, and luxation of the hip and progressive joint limitations. It leads also to skin lesions, cataracts, cardiac malformations, and luxation of the hip [1,2,3,4,5]. CCP is classified into four main types: 1) the autosomal dominant Conradi-Hünermann's type, involving long bones asymmetry, spinal and facial malformations, and sometimes cataracts and ichtyosis; 2) the autosomal recessive rhizomelic type, with malformation of the long bones, cataracts, skin lesions, and mental deficiency (often lethal during the first year of life); 3) the X-linked dominant form, lethal for boys; and 4) the X-linked recessive form, described only in boys . Craniofacially, a combination of dysmorphic features might be encountered in children with chondrodysplasia punctata such as asymmetric head, frontal bossing, flat nasal bridge, dysplastic auricles, mongoloid palpebral fissures, hypertelorism, and high arched palate. Skeletal abnormalities, however such as asymmetric mild shortening of all long bones, bowing, stippled epiphysis, vertebral scoliosis, clefting, or wedging, flexion Contracture of the joints, clubfoot or valgus deformity are frequent features [7, 8]. The diagnosis relies on a calcified stippling of the hyaline cartilage and bones, which usually disappears at the age of two or three years . No treatment is available, but many orthopedic procedures are necessary to limit functional repercussions of the disease and to stabilize spinal and limb malformation . Whether respiratory tract cartilage is also involved in this disease remains unclear. However, there are several reports of tracheal stenosis in CCP [9,10,11,12,13]. We report two cases of RCDP the first came for bilateral congenital cataract and the other came for insertion of parentral feeding catheter, both needed two sessions of anesthesia. This report elicits the precautions according to features of child anesthesia safety and management. 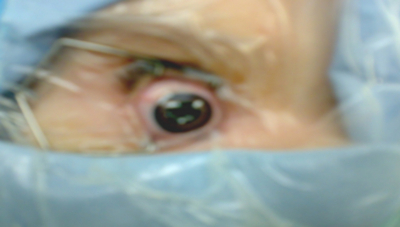 A newborn girl with RCDP underwent bilateral cataract extraction. The patient was mentally retarded, and clinical examination showed disfigured limbs. The clinical examination elicited no cardiac and respiratory abnormalities as it is expected to have anomalies and may be tracheal stenosis in these children. The anesthesia technique was based on inhalational anesthesia preceded by pre-oxygenation unsung basic stander monitoring (pulse oximetry, capnography, ECG, NIBP, temperature) and intubation under sevoflurane anesthesia extreme gentleness to manipulate the head and neck during intubation. No previous anesthesia to report any specific precautions so simple technique was adapted with intravenous open access. Intubation was uneventful using small endotracheal tube. The lens extraction took 45 and 40 minutes in the first and second sessions respectively. A five month old girl with RCDP underwent long tern central vein catheter for parentral feeding due to difficulty in swallowing. The patient was already diagnosed as a case of RCDP. She was mentally retarded, having disproportionate lower jaw [photo 2, 3 and 4] and disfigured limbs. The clinical examination elicited no cardiac and respiratory abnormalities. The anesthesia technique was based on inhalational anesthesia preceded by pre-oxygenation unsung basic stander monitoring (pulse oximetry, capnography, ECG, NIBP, temperature) and intubation under sevoflurane anesthesia extreme gentleness to manipulate the head and neck during intubation. No previous anesthesia to report any specific precautions so simple technique was adapted with intravenous open access. Intubation was difficult, due to failure to see the larynx with direct laryngoscope. The endotracheal tube was introduced into trachea on the third attempt with the help of stylet.. The tunneled CVP was inserted safely within 55 minutes. The patient recovered fully from anesthesia and return to pediatric word. After three weeks the patient came in for revision of the tunneled CVP. The anesthesia team consulted with the surgeon and they plan the procedure to be done under general anesthesia . On the light if previous experience of difficult intubation an appropriate laryngeal mask airway (LMA) inserted after sevoflurane inhalation. The same principle was applied regarding anesthesia technique. It was as well based on giving inhalational anesthesia preceded by pre-oxygenation unsung basic stander monitoring (pulse oximetry, capnography, ECG, NIBP, temperature) and intubation under sevoflurane anesthesia extreme gentleness to manipulate the head and neck during LMA insertion. The procedure took 75 minutes and the girl recovered fully. The clinical features and diagnosis usually can be established in the pediatric service. The anesthesiologist would need the possible danger of these congenital anomalies and their effect on the central nervous system, cardiovascular system ad respiratory system. In the newborn age situation may arise to do anesthesia for palliative procedures like congenital lens extraction, or feeding lines insertion to reduce aspiration and difficult feeding situation. In older children may be the cardiac valves and cardiac anomalies may be more evident clinically so the central nervous system manifestation like mental retardation and seizers. Respiratory infection is common especially if related to repeated aspiration and may be important for anesthesiologist to guard against this hazard, in tthis two cases intubation was done in suitable controlled way and when in second patient the intubation proved difficult due to disproportionate jaw LMA was used to the advantage of affected child. Authorities recommended not to use muscle relaxant except after maintaining an airway . Proper fasting instruction before inhalational anesthesia would reduce aspiration risk. To conclude, CCP cases, and the lethal type RCDP can come to the attention of anesthesiologists for occasional palliative procedures in ophthalmic, pediatric, cardiothoracic and orthopedic surgeries to treat lesion during growth. The anomalies of the skeleton may divert the attention to problem of heart and lungs. The precautions for safety of these children include attention to difficulties in tracheal intubation seem to be essential for the anesthesiologist caring for these patients. Keeping close monitoring and simple non complicated anesthesia may solve their clinical problems without extra risks. The authors would like to express their thanks to Miss Raghad MSM Takrouri for checking references regarding RCDP in Syndrome  and for selecting photo for printing . Also thanking the parents of case 1 and 2 (whom would be anonymous) for their consent to use material concerning their children for sake of medicine..
1. Maroteaux P. Chondrodysplasie ponctuée. In: Maroteaux P, ed. Les maladies osseuses de l'enfant. 3rd ed. Paris:Médecine-Sciences Flammarion, 1995:57-64. 3. Rittler, M; Menger, H; Spranger, J. Chondrodysplasia punctata, tibia-metacarpal (MT) type. Am J Med Genet. 1990;37:200-208. 4. Bergstrom, K; Gustavson, K-H; Jorulf, H. Chondrodystrophia calcificans congenita (Conradi's disease) in a mother and her child. Clin Genet. 1972;3:158-161. 5. Burck, U. Mesomelic dysplasia with punctate epiphyseal calcifications - a new entity of chondrodysplasia punctata? Eur J Pediatr. 1982;138:67-72. 6. Sanchez E, Munier F, Evequoz B, et al. Phénotype oculaire chez un enfant atteint d'une chondrodysplasia punctata, forme rhizomélique. Klin Monatsbl Augenheilkd 1997;210:329-31. 7. Curless, RG. 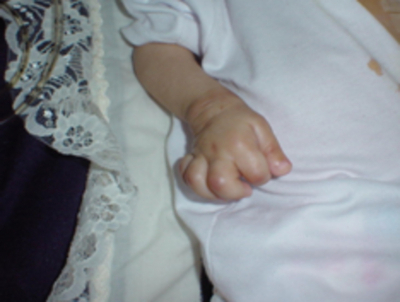 Dominant chondrodysplasia punctata with neurologic symptoms. Neurology. 1983;33:1095-1097. 8. Finkel, JJ; McKusick, VA. Case report R - chondrodystrophia calcificans congenita. BDOAS. 1969;5:322-325. 9. Gwinn JL, Lee FA. Conradi's disease (chondrodystrophia calcificans congenita). Dis Child 1971;121:503-4. 10. Comings DE, Papazian C, Schoene HR. Conradi's disease. chondrodystrophia calcificans congenita, congenital stippled epiphyses. J Pediatrics 1968;63:63-9. 11. Hochman M, Fee WE Jr. Conradi-Hunerman syndrome: case report. Otol Rhinol Laryngol 1987;96:565-8. 12. Yorozu T, Takino Y, Shimada M, et al. Anesthetic management of a patient with Conradi's syndrome (chondrodysplasia punctata): a case report. Masui 1989;38:1092-5. 13. Bissonnette B, Luginbuehl I, Marciniak B, Dalens B. Syndromes: Rapid Recognition and Perioperative Implications New York: McGraw-Hill, 2006. ISBN 0-07-135455-7.